This conversion should also work for the NTSC 6567 to 8562. The 6569/6567 and 8565/8562 are almost pin for pin compatible. The only difference being the 6569 has 12v on pin 13 and the 8565 has 5v on pin 13. To get rid of the 12v supply to pin 13, remove the ferite bead shown above. 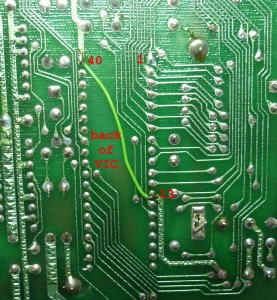 Solder a link on the back between pin 40 (+5v) and pin 13 of the VIC socket. Switch on with VIC removed and check for +5v on pin 13. 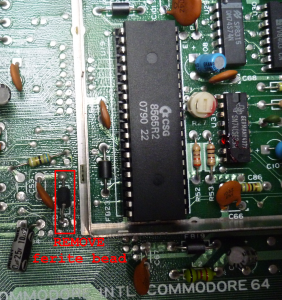 If all is OK, switch off C64, insert 8565 and you should now be up and running.